WordPress has its own huge library, for a non profit organization WordPress provides the ability to accept donations from your members, donors, sponsors, or supporters. Here are some of our favorite free donations wordpress widgets, with an emphasis on widgets and donate buttons. They are all both easy for donors to use and affordable for nonprofit fundraising at all levels. If you enjoyed the following article we humbly ask you to help us spread the word by sharing this article with your peers! You may be interested in the following modern trends related articles as well: Free Keynote Templates and Mockups, Free Cookies Plugins for WordPress, Free WordPress Business Themes for 2015 and Premium WordPress Themes for Couples. Seamless Donations by Designers does all this and more – and all you need to do is embed a simple shortcode and supply your PayPal Website Payments Standard email address to start receiving donations today. A fully customizable fundraising thermometer with PayPal integration, custom skins and support for multiple vertical and horizontal thermometers. Multiple thermometers can be configured and displayed separately on different pages or posts. Each thermometer supports individual customization, targets, currencies and progress tracking. MyCausora is a free fundraising solution for websites and nonprofits that want to support their favorite cause. MyCausora enables you to easily accept donations for a cause of your choice on your website. Easily add a donation button to your site using InspirePay.com. Get paid via PayPal, Dwolla, and Credit Cards. Sidebar widget which connects to your InspirePay page. Editable widget title, pre-form text, submit button text, and post button text. Easily set a default payment amount, or allow your customers to choose. PayPal charges high fees for cross border transactions. If you are one of the fortunate few that have paypal accounts in multiple currencies then this plugin is for you. It allows you to route different currencies to specific paypal accounts. 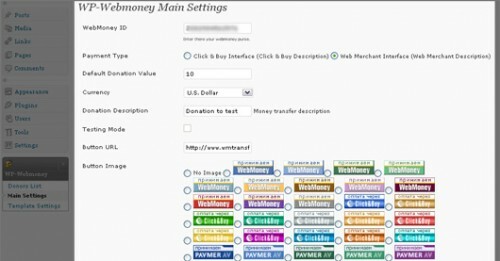 This plugin allows you get donations and accept payments from people using WebMoney system. WebMoney is the most popular payment system in Europe. Charity thermometer plugin uses a simple shortcode to display an great looking thermometer on your WordPress page, post or sidebar to indicate the progress of your fund-raising and charity activities. Adds a bitcoin address field to user profiles so that authors can accept bitcoin donations via an automatically generated bitcoin donation box after their posts or anywhere on the site with the [bitmate-author-donate] shortcode. The all in one donation plugin, create different kind of donations, set goals, monitor your results, create donation forms, set thank you emails. A paypal or wepay button with a text box so the donors can pick right away how much they want to donate. Place PayPal donation button on your website in two different ways with minimum setups. 1. Just drop the widget on a widget area, fill in your data and you are ready to accept donations. 2. Insert PayPal donation button in the post with shortCode.